Windows Vista allows you to remove red eye from photos you’ve taken. Red eye is caused when the camera catches the blood-red retina in the back of the eye. Vista’s Fix Red Eye tool replaces the red with the more natural black, fixing a problem that’s plagued party photographers around the world. 1Open the Windows Photo Gallery, click your red-eye photo, and click the Fix button. Zoom in on the red eye area by clicking the magnifying glass icon on the Navigation bar along the window’s bottom and sliding the bar upward. Then drag the photo with your mouse pointer until the red eye comes into view. 2Click Fix Red Eye, drag a rectangle around the red part of the pupil. 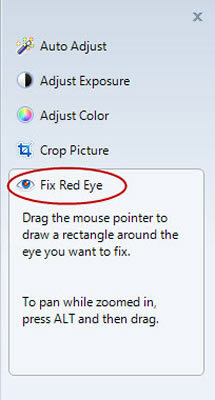 Click just above the red portion of the pupil, hold down your mouse button, and point down and to the side to surround the red portion with a rectangle. Like magic, releasing the mouse button turns the red into black.